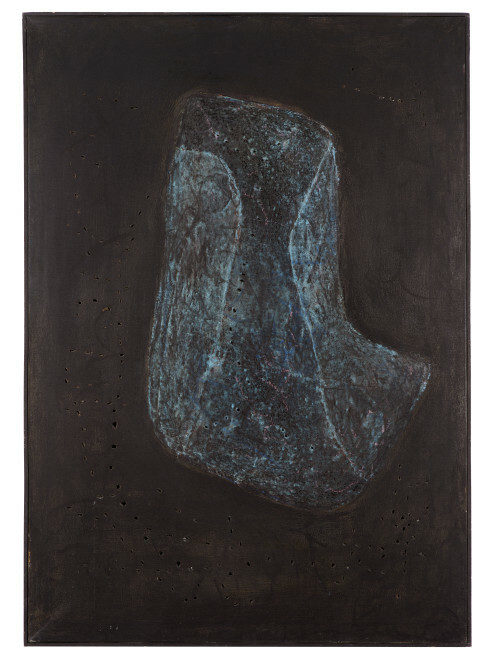 New York, Gagosian Gallery, Lucio Fontana: Ambienti Spaziali, 3 May – 30 June, no. 228, p.
‘I do not want to make a painting, I want to open up space, create a new dimension for art, tie in with the cosmos as it endlessly expands beyond the confining plane of the picture’ (L. Fontana, quoted in J. van der Marck and E. Crispolti, La Connaissance, Brussels 1974, p. 7). Executed in 1956, Concetto Spaziale is a significant example of Lucio Fontana’s Gessi series on which he worked from 1954 to 1958. In that same period, the artist was working on his Buchi Pietre, Barocchi, Inchiostri, Carte and Olii. As the word itself suggests, this series is characterized by the use of sombre hues of chalks on dark (mostly either brown or black) backgrounds. The Gessi present irregular and abstract shapes that seem to fluctuate in the darkness of the canvases thus creating an almost surreal scene. The canvases were then pierced with constellations of holes. The Gessi epitomize Fontana’s fascination with the cosmic universe. As the viewer looks at the light-blue silhouettes that emerges from the darkness of the canvas, he is reminded of a constellation standing out from the darkness of the night sky. This correlation of the Gessi with the cosmic space is emphasized in other works of the series, where the spherical silhouettes vaguely recall the irregular surface of the moon. The holes pierced in the canvas physically open up the work to the possibility of infinite and cosmic dimensions of space. The distance between the work and the viewer is reduced by these openings that, as opposed to the Buchi series, are not incidentally and frenetically placed, but rather gently accompany and complement the blue silhouette. The work is an example of Fontana’s fascination with the third and fourth dimensions as it showcases his ability to open the canvas to space and time. With their dark tones and irregular shapes the Gessi are arguably Fontana’s most puzzling and mysterious series and the work presented here is an outstanding example of the series. Please note that the availability and price of the above work are subject to changes without prior notice. Where applicable ARR will be added.